Although I tend to cover a lot of high-tech topics and products for other posts I write on the web, I don’t often use those devices in my “real life” at home. And I don’t tend to write about the specific low-tech methods that my family and I do use to try to live more sustainably in real life. Go figure. Some of these ideas may seem like no-brainers (though I’m constantly surprised at how many people dismiss them anyway, because they may require either a little more effort or changing well-entrenched habits), and some of them may not be feasible, depending on where you live (due to the climate, the type of dwelling you live in and what your neighborhood is like, what the weather is like during certain seasons), but chances are, you can probably find at least one thing to put into practice in your daily life. 1. Solar and indoor clothes drying: In a culture where electricity and natural gas are relatively cheap, we tend to use them rather generously, especially to dry our clothes or heat our houses or heat our water. And aside from saving a little bit of money, reducing our energy use can also have an effect on the overall environment, whether it’s less air pollution and GHG emissions or less dependence on fossil fuels, so to my way of thinking, it’s almost always better to use less energy to get the same job done. We all wash our clothes regularly (some would argue that we wash them too regularly, and could cut our energy and water use further by just wearing things more than once before washing them), and many people also use a clothes dryer to finish the process. But if you live in an area with abundant sunshine at least part of the year, the old-school clothesline in the backyard or balcony can get the job done just as well (and without added wear and tear on our clothes). For those who live in places where that’s not a viable method, or during the winter, clothes drying racks that can be set up indoors are an option. While your clothes may not dry as fast inside, out of the sun and wind, they will still get dry without having to use additional energy, and in arid regions, have the added benefit of adding a bit of moisture to your indoor air. 2. Passive solar heat: Even if you can’t afford a solar power system for your home, if you get a lot of direct sun on your house throughout the winter, adding passive solar air heaters can effectively raise the indoor temperature, cutting down on the need for external energy sources for heating. This project has been on my list for a while now, but because temperatures have been so mild in my area (southern New Mexico) this winter, I haven’t made it a priority. Based on reading the experiences of those who have built passive solar heaters, including the efforts of a Denver group to install them on the homes of low income area residents, they can be an effective method of harvesting free heat. 3. Insulating or shading windows: By blocking the direct sunlight from windows during the summer, and adding insulating curtains to windows in the winter, homes can be kept cooler in summer and warmer in the winter, without needing to use any extra energy. We’ve experienced a big improvement in moderating the temperatures through both winter and summer by either shading windows (outside shading is more effective, but curtains and blinds inside the windows also work) or adding heavy homemade curtains to them in the winter time. 4. Solar chargers: I have several small solar chargers that I use to recharge my phone, MP3 player, or other gadgets, which lets me take advantage of free renewable energy on sunny days, and lets me rely less on electricity from the grid for these devices. I have a GoalZero Guide 10 Plus package, which charges up a battery pack to recharge other gadgets, and it can also be used for rechargeable batteries that can be used in other small devices. The other one (a WakaWaka solar light) is a combination solar charger and LED light, so I can also use it for a reading light after dark. 5. Reuse of household greywater and rainwater catchment: Depending on where you live, you may find that regulations governing the reuse of household greywater can be very restrictive, but in NM, they are rather progressive, and average households can use greywater without running afoul of the law. In other areas, using buckets to bail out the bathtub after a shower or bath, and putting that water on your yard or landscaping is one way to get around those regulations. Another method is using a container to catch the cold water that comes out of the tap while you’re waiting for the hot water to get there, and using that water for houseplants or garden (it’s not even greywater, as it hasn’t been used yet). Adding some form of rainwater catchment device to your downspouts (either homemade or readymade) will allow you to keep some of the rainwater in your yard for plants, instead of sending it directly down to the storm sewers. If adding rain barrels isn’t OK where you live, then one possibility is directing the water from your downspouts into planting areas or a small pond, as long as you plan for overflow events and have a way to direct the water to different areas of the yard. 6. 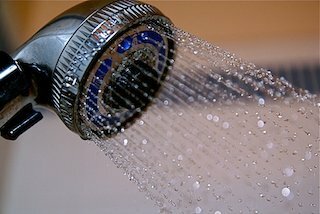 Shorter showers and flushing less: Taking short showers (or Navy-style showers, where you turn the water off while soaping up, and turn it back on to rinse off) can make a big difference in household water use, especially if you shower every single day. Not flushing the toilet when there’s just pee in it is another method of conserving a valuable resource (why use gallons of clean water to flush every time you urinate? ), and if you live in the country or aren’t afraid of being caught “fertilizing the yard” by your neighbors, peeing outside is a viable option. In addition, if you want to get a little more radical in your approach to using less water in the bathroom, you can set up a humanure system (also referred to as a sawdust toilet) and compost your waste. 7. Reusable rags for cleaning: We don’t ever use or buy paper towels, but instead use cloth rags (either washcloths from the thrift store, or made from old towels) to clean with. These rags can be used over and over again and last for a very long time, and can be washed with your other towels or clothes. They are also much tougher than any disposable towels, as you can scrub just about anything without them coming apart in your hands. We also use washcloths instead of baby wipes when our young ones are in diapers (also cloth), and using both cloth diapers and washcloths instead of buying disposables has saved us a lot of money over the years. 8. Sprouting at home: Learning how to sprout your own seeds is one small way to get started in home food production, and it’s much cheaper (and safer, in terms of the possibility of contamination from mass-grown sprouts) than buying sprouts at the grocery store. Sprouting at home is easy to do, and it doesn’t require a lot of space or a lot of sun (only indirect light to green them up at the end), so it can be a fun way to get fresh homegrown food into your diet, even in the winter. 9. Buy in bulk: We buy all of our staple foods in bulk, from our local food co-op, which allows us to skip the packaging, to only buy what we need (or to buy a lot to stock our pantry), and to save money (when compared to packaged versions). We also prepare most of our food from scratch, which is again cheaper than the same quality (organically grown, non-GMO) packaged foods, and gives us more control over what goes into the food we eat. We’ve found that having plenty of our staple foods at home keeps us from spending impulsively on prepared or “junk” foods, and has the added value of keeping us and our kids more connected to our food. 10. Cleaning with simple green products: To clean our house, we mostly use Dr Bronner’s liquid soap, which are very concentrated and can be diluted quite a bit and still be effective. It doesn’t have a strong scent or leave any residue behind, and can also be used in the bath (or to wash your hair or brush your teeth). We also use white vinegar to clean surfaces, and baking soda to deodorize. I’m a fan of the “no poo” method of hair care, and use baking soda to wash my hair and apple cider vinegar to condition it, which is not only cheap to do, but just as effective as shampoo, without the alphabet soup of added ingredients and scents. These are some of the low-tech and simple methods that I and my family use to try to live greener and more sustainably in our home, and while I know that not all of these may suit your lifestyle or locale, you might find that by implementing some of them, you’ll also see other ways to go greener in your everyday life. This isn’t an exhaustive list, by any means, so I’d be interested in reading your comments on other simple or low-tech ways that you use to live more sustainably. ← Could Pyrrole Disorder be Causing Your Child’s Meltdowns?